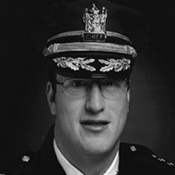 Chief Steven Krokoff started his career with the Albany Police Department in 1993 after graduating from the University at Albany in 1992 with a degree in English. He initially was assigned to the Patrol Division after graduating from the police academy where he served from 1993 to 2000. Since then, he has made his way through the ranks, holding the positions of sergeant, commander, assistant chief and deputy chief, and overseeing different divisions of the department. Since he became chief in 2009, Krokoff and his staff have been instrumental in redefining the police department’s community policing model by working with the mayor and a diverse group of community leaders to improve the quality of life throughout the city. In the fall of 2009, the Albany Police Department’s administration recognized that there was a need for philosophical change in how the department fulfills its mission in serving the citizens of Albany. With the combined perceptions of an unsafe city, and a disconnect between citizens and the police, it was determined that the department and city alike would be better served to move to a community policing-based philosophy. Since its inception, the Albany Community Police Advisory Committee has worked hand-in-hand with the police department to close the gap between the members of the community and the police department. Some of the topics that will be discussed include: the implementation of the Neighborhood Engagement Unit (NEU), Team Policing Concepts, Strategic Planning, Problem Oriented Policing, SARA (Scanning, Analysis, Response, and Assessment), and The Commission on Accreditation for Law Enforcement.